The scandalous errors made by the Presidency in the appointments into boards of agencies and parastatals of the Federal Government has continued to unfold. The government made appointments into the board of the Nigeria Sports Federation which is against the status of FIFA, which insists that football should be run outside the direct interference of governments. 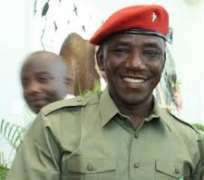 But the Minister of Youth and Sports, Solomon Dalung, has said it was an error. Danlung, according to a report by the News Agency of Nigeria wants football stakeholders to remain calm over some appointments into the NFFboard by the Federal Government. Dalung, in a statement on Saturday in Abuja, said efforts were being made to correct an oversight made following the recent appointments into the NFF board. The Federal government had announced the appointments on Friday of over 1,000 members, including 209 board Chairmen. In the list were names of f-0ur persons who are dead. They are to fill positions on the boards of government parastatals, including the NFF and the National Youth Service Corps (NYSC). Others are the National Institute for Sports and the Citizenship and Leadership Training Centre which are all under the Ministry of Youth and Sports Development. Dalung, in the statement released by Nneka Ikem-Anibeze, his Special Assistant on Media, said the appointment of members into the NFF board by government was an oversight. “By virtue of their (NFF) statutes, members are elected and not appointed. “The appointments were an oversight which is being sorted out. NFF is governed by statutes and board members are elected by congress and not appointed. The Minister also stated that government and football's world governing body FIFA were in talks to clarify the issue and assure them that no harm was intended. “I have spoken with ythe FIFA General Secretary over the situation in Nigeria and conveyed Federal Government's commitment to upholding the governance structure of the NFF. “All efforts are on course to liaise with CAF and FIFA on constructive engagement that the situation may likely attract. “The current board of NFF under Amaju Pinnick has provided leadership but their performance is subject to a congress and not appointment,'' Dalung stated.